Triangles have fascinating regularities. It doesn’t matter how unequal the sides, the altitudes always meet at a point, and so do the perpendicular bisectors. However, if the triangle is made up of violin, viola and cello, there is no such automatic balance. The string trio is such a daunting compositional form—presumably for the difficulty of defining harmony with relatively lean instrumentation— that American composer John Harbison, now in his seventies, only just completed his first and only. The generically titled String Trio was doubly-celebrated by Camerata Pacifica on Friday night: in a world premiere performance, and as the leading work on their brand new all-Harbison CD. 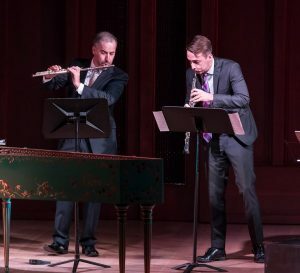 The season opener, a twenty-fifth anniversary event for the acclaimed chamber group, also included Mozart’s charming Flute Quartet No. 1 in D Major and Schubert’s epic Piano Trio No. 2 in E-Flat Major. The evening was, in fact, a kind of epitome of what the Camerata experience is all about: the solid presence of core principal players; new visiting artists of renown culled from an international roster; treasured compositions from the European canon; and a forward-leaning faith in the infinite possibilities of tomorrow’s music. The occasion opened aptly with the featured flute of founder and artistic director Adrian Spence, who reminded the audience that the inspiration for Camerata took shape during his mid-twenties while he moonlighted at a futon shop. 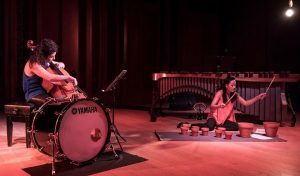 Since then, the group has become a professional and artistic model for what twenty-first century chamber music is all about. The Mozart also introduced new faces: Armenian-born violinist Movses Pogossian, a veteran chamber musician who is passionate about new music; and New York-based cellist Raman Ramakrishnan, whose credentials include Yo-Yo Ma’s Silk Road Ensemble. 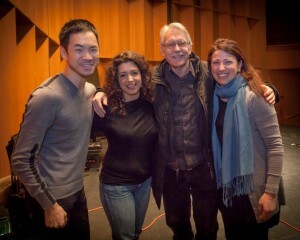 Principal violist Richard Yongjae O’Neill completed the foursome. The meticulously crafted and mesmerizing String Trio seems already destined for rank with the masterpieces of the twenty-first century. Harbison, present at the premiere, took the stage in his signature plaid shirt and jeans—looking more the part of a Vermont maple farmer than Pulitzer Prize-winning composer—and made the case that his Trio, like most serious music, deserves, perhaps requires, repeated listening. Yet what followed was accessible, and felt effortlessly organic in its unity, bursting with the spirit of spontaneity. Each of the six movements is distinct: an alteration of aggression and repose in the first; a dialogue with silence in the second; a fractured waltz in the third; the jazz-and-folk-infused fourth, etc. Principal cellist Ani Aznavoorian joined Pogossian and O’Neill for this impressive premiere. No Camerata Pacifica anniversary would be complete without a representative reminder of the stellar keyboardists that have graced so many performances. Principle pianist Warren Jones was joined by Pogossian and Ramakrishnan for a fiery rendering of the Schubert. This entry was posted in Music and tagged Adrian Spence, Ani Aznavoorian, Camerata Pacifica, Hahn Hall, John Harbison, Mvoses Pogossian, Raman Ramakrishnan, Richard Yongjae O'Neill, Warren Jones on September 17, 2014 by joemiller.